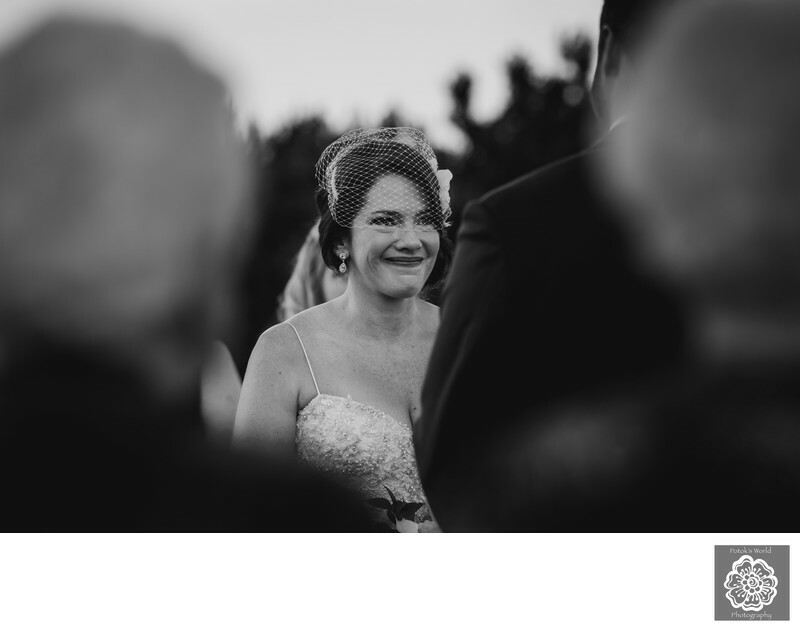 Can anything beat a photo of a wedding participant crying and smiling simultaneously? In the opinions of these DC wedding photographers, no. An image of someone so happy that tears start running down their cheeks is extremely powerful and impactful. It also encapsulates the emotional tenor of a wedding so perfectly. A marriage celebration in Washington, DC, is supposed to be a testament to overpowering love, joy and optimism. Ideally, those feelings should be so strong that everyone present — not just the couple — gets swept up in them. The wedding party, the wedding guests and the families of the bride and groom should experience them. A photograph of someone crying tears of joy shows that those emotions have reached the point of bubbling over. Not surprisingly, these images resonate with the brides- and grooms-to-be who hire us to photograph their nuptials. They want a Washington, DC, wedding photographer to tell the story of their day and all the emotions it elicits. Pictures like the one featured here can lay out that entire narrative in a single shot. They show a wedding participant — the bride, in this case — experiencing the gamut of wedding-day emotions in one moment. An individual image that sums up the feel of an entire marriage celebration is extremely valuable. And it is the type of shot we try to deliver to every bride and groom who book our services. We took this particular picture during an outdoor wedding ceremony at Wolftrap Farm near Charlottesville, Virginia. That wedding venue is a lovely option for DC-based fiancés looking for a rustic marital event. It might be a stretch to say that Wolftrap Farm is part of the Washington, DC metropolitan area. However, it is still easily reachable from the heart of the Nation’s Capital. Brides and grooms, as well as their wedding guests, can get to the venue from DC in less than two hours. Out-of-town attendees who fly into Dulles International Airport have a similarly easy trip to Wolftrap Farm. Future spouses willing to make the trip from Washington will be rewarded with an gem of a rural wedding venue. Wolftrap Farm’s elegant Manor House can accommodate nearly 60 guests. Its front lawn has an unparalleled view of the rolling foothills of the Southwest Mountains. That makes a great site for tying the knot amid the beauty of nature. The Pavilion, a former equipment barn, comes outfitted with a stage, a dance floor, lights and ceiling fans. A bride and groom who want rollicking post-ceremony reception have everything they need! As this photograph demonstrates, the ceremony portion of this marriage celebration was obviously the highlight of the day, photography-wise. The bride made her appearance by emerging from the Manor House. That was where she had gotten her hair and makeup done and where she had donned her beautiful wedding dress. She then walked between the rows of chairs arranged for the wedding guests and met her future husband at the altar. They stood facing one another for a few moments with the beautiful green mountains in the background. The soon-to-be-spouses took a few deep breaths and just enjoyed being in one another’s presence. It was when this lovely bride heard her husband-to-be’s vows that we captured this unforgettable image. The groom had just finished pledging himself to her for eternity. Understandably, his future wife was so overjoyed that she started grinning from ear to ear. At the same time, she was so moved that a single, solitary tear welled up in her eye. It then ran slowly down her cheek, and that is when we snapped this picture of her smiling and crying. Location: Wolftrap Farm, 17379 Wolf Trap Dr, Gordonsville, VA 22942.